The science of Solar Probe Plus – NASA’s first mission to “touch” the sun – was on stage last month at the American Geophysical Union’s Fall Meeting in San Francisco. With some 25,000 attendees, representing nearly 100 countries, AGU’s Fall Meeting is the world’s largest Earth and space science conference. Solar Probe Plus team members took full advantage of the large audience with presentations and posters on mission science, as well as a multimedia “flash talk” from Project Scientist Nicky Fox at the NASA exhibit. “Not only was this meeting a chance for us to excite people about the launch – which is now less than two years away – but it was also a wonderful opportunity to exchange ideas with colleagues and have serious conversations about how what we learn from Solar Probe Plus will revolutionize our understanding of the sun,” said Fox, a scientist at the Johns Hopkins University Applied Physics Laboratory (APL) in Laurel, Maryland. Set to launch in July 2018, Solar Probe Plus will provide new data on solar activity and make critical contributions to our ability to forecast major space-weather events that impact life on Earth. The spacecraft will actually plunge several times through the sun’s atmosphere, facing brutal heat and radiation conditions – and ultimately providing humanity with the first ever close-up view of a star. Check the links below for information on some of the Solar Probe Plus sessions, posters and presentations delivered at the AGU Fall Meeting. Each page offers links to abstracts or summaries of the information scientists presented or discussed. Solar Probe Plus is part of NASA’s Living With a Star program to explore aspects of the sun-Earth system that directly affect life and society. LWS is managed by the agency’s Goddard Space Flight Center in Greenbelt, Maryland, for NASA’s Science Mission Directorate in Washington, D.C. APL manages the mission for NASA and is designing and building and will operate the spacecraft. Learn more at http://solarprobe.jhuapl.edu. 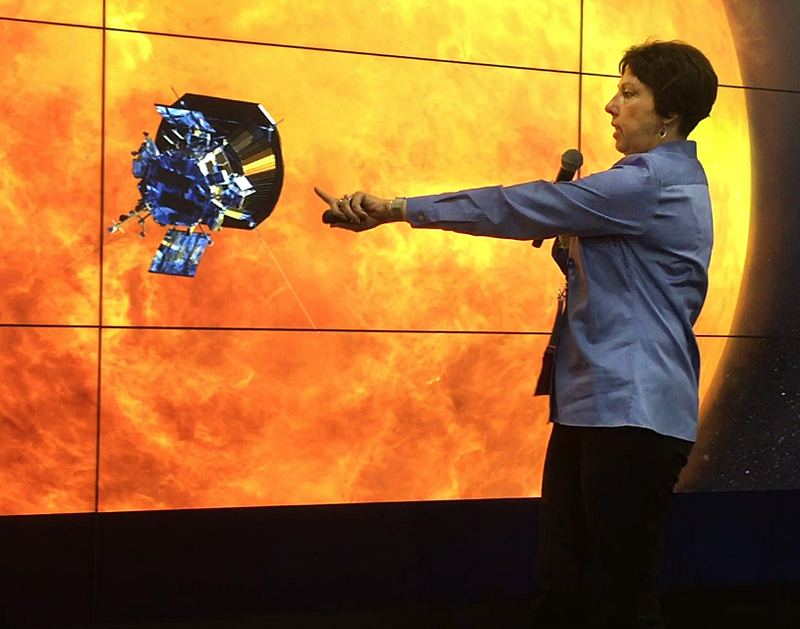 Project Scientist Nicky Fox points out features on the Solar Probe Plus spacecraft during her Dec. 13 flash talk at the AGU Fall Meeting in San Francisco.